During the month of July, Valencia really pulls out all the stops in an effort to help its citizens forget about the suffocating heat. 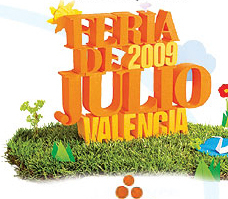 The events which make up the Feria de Julio are almost numberless, and on almost any given day, you’ll be able to find something interesting to do. There’s no way to delineate everything that’s going on, so if you’re in the city make sure and stop by a tourist office and pick up one of the festival brochures. Migues Bosé, Amaral, Anastacia and James Taylor are just some of the big names which will be performing in the Viveros Gardens. Tickets are around €18 and can be bought in the Corte Ingles. Every Saturday night, between the Playa de las Arenas and the Veles e Vents building. These are pretty impressive fireworks, and they get underway at midnight. Again, these events barely scratch at the surface of everything that’s on offer. What are you most excited about? Leave a comment if you know of another event which deserves to be highlighted!